For my concept I have a task bar that has 3 functions. 'Save' 'Load Preset' and 'Help'. Save and Help both have simple icons that don't require text. Which is great, because I would like to leave as much room as possible for the images and many, many items of clothing. The 'load preset' icon has gotten me into some trouble however. All the feedback I got was mostly negative about these options. The first was perceived to be a filter button. The second was confused for a link to the games section. The third was confused for a link to the closet or maybe even to remove all clothing. 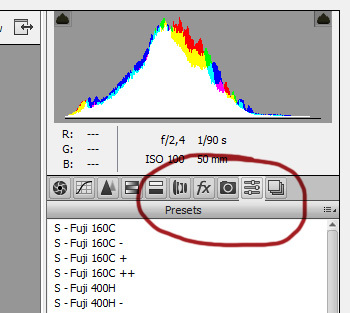 What would be a better, less confusing way to picture 'Load Preset' or 'Presets'? The concept is of the 'dress up doll' kind. Save let's you either publish or save as a preset. Load presets will let you load a previous look you've created into a preset. Help gives you a small explanation screen. There are some filters and sort buttons too but they are not in direct contact with the task bar. Other features on the site include an inventory and a closet as well as shops and games. Given the specific nature of the presets you're working with, I'd suggest reconceptualising them from the top, and using that new concept to derive the icon - I'm talking about your switching your thinking from "preset" to "outfit" or "costume" or "ensemble"... take the concept you mentioned of the closet, and use that to your advantage: you've a general "closet" for individual clothing items, and an "ensemble closet" for presets - for outfits. If I understood correctly, the mechanics between the Save button and the Load Presets is similar as in Photoshop when we take Snapshots. The Snapshot command lets you make a temporary copy (or snapshot) of any state of the image. You can compare effects easily. Switch between the snapshots to find the settings you like best. In your case, instead of Save the option should be to take a Snapshot, or a Photo. The Load Presets is to show the Previous or the Original Snapshot. As soon as the user start making new changes, the left button turns yellow and the right button gray. Your client is overthinking it. Your first option can indeed mean filter, but works for presets just as well. This is a screenshot from Adobe Camera Raw, and honestly these guys probably know better about this than your client. Try to find more examples that would prove this point. Otherwise you can try to go a bit more abstract and just show an up arrow for 'load' and a down arrow (the same but flipped) for 'save'. No need to be too creative when this stuff is already so overused it becomes the norm. Its funny when some clients think the whole success of their business hangs on every bit of creative juice they can squeeze. Not the answer you're looking for? Browse other questions tagged icon symbols or ask your own question. Icon to represent a music mix?